Spinach/palak/ palong shaak is the leafy green that was cooked the most often in our house. On occasion we would eat laal shaak or red amaranth which I loved because of that fabulous colour it oozed onto the rice in my plate. Moni was not fond of cooking though she was a good cook and tended to make the simpler dishes that required less prep. So greens like methi never appeared on our dinner table. In spite of its frequent appearance at meals I never got tired of palong shaak and I cook it quite often too. 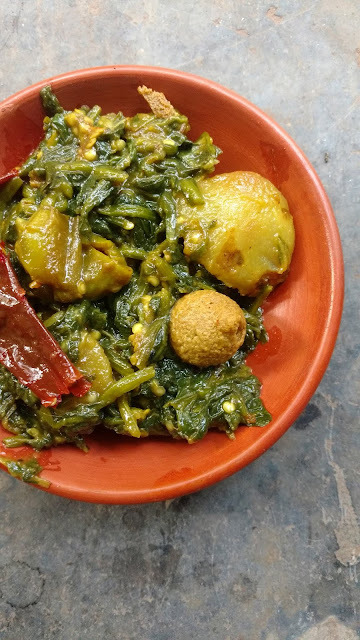 Palong shaak features in many Bengali recipes and this one with brinjal, potato and 'bori' (dried lentil dumplings that look like Hershey's Kisses in shape) is a general favourite. Like most everyday dishes, this shaak ghonto is quite easy to cook. This dish is also vegan. Chop the spinach, wash thoroughly in plenty of water and leave aside in a colander to drain. Peel and cut the potato into smallish cubes. Cut the brinjal into proportionate cubes. Heat oil in the wok and fry the potatoes, brinjals, and the boris separately and remove to a plate/vessel. Add a little oil to the wok and let it heat properly. Chuck in the panch phoron and the dried red chillies and fry for a few seconds. Don't let it burn. Add the drained spinach leaves and mix well. Add salt and turmeric, stir to mix, lower the flame and cook the spinach covered for around five minutes. Add the fried potatoes and cook till the potatoes are soft and most of the water has dried up. Add the brinjals, mix well and cook for a couple of minutes. Finally add the fried bori, mix them in and take off the heat after a minute or so. Serve the ghonto as an accompaniment to rice and daal, or enjoy it with hot chapatis.